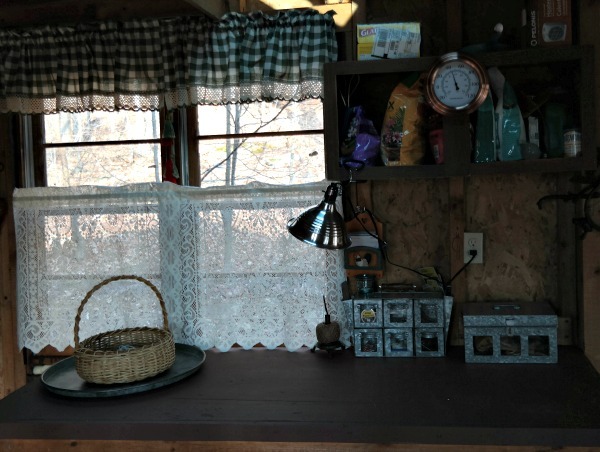 I have shared a few posts in the past about my little garden cottage. Ok, maybe more than a few. I can't help it...I'm a little obsessed. In this post I shared with you how much work was done to get it to the point when I took the above photo. 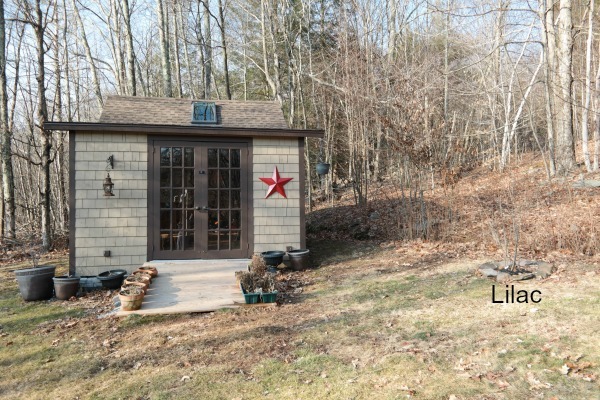 There was a ton of work involved - this little garden cottage was truly a hot mess when I bought the house. There was some big time organizing done in the fall to make the space function better. And a bit of decorative puttering over the winter. It's a great space for potting up plants and tinkering a bit....but I want more. I dream of a a little cottage surrounded by gardens with a swing nearby where I can sip coffee in the mornings and wine in the evenings among the flowers. There's still a lot of work to do here to even come close to my ideal. I took the first step last spring by planting a very special lilac near the cottage. Mom and Dad brought me that lovely lilac as a housewarming gift last spring when they first saw my new home. I placed the lilac where I could enjoy it's flowers and fragrance every time I go in and out of my little garden cottage. Which is a LOT in spring and summer. 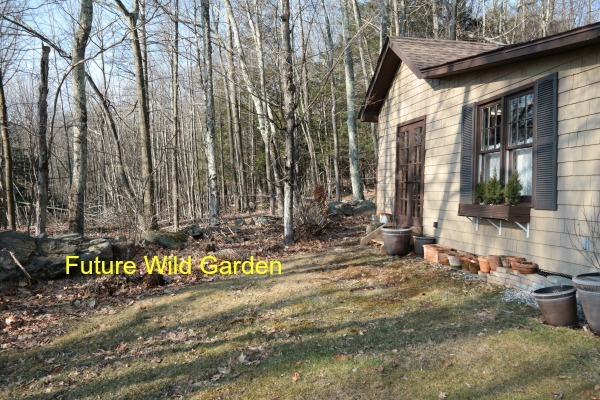 In the fall I dumped all the dirt from the flowerpots in the area by the stone wall so I can start a wild garden there. I'd like to put in some bee balm, black eyed susans, milkweed, coneflowers, and who knows what else....anything that likes to go mad and will spread like crazy in that area. 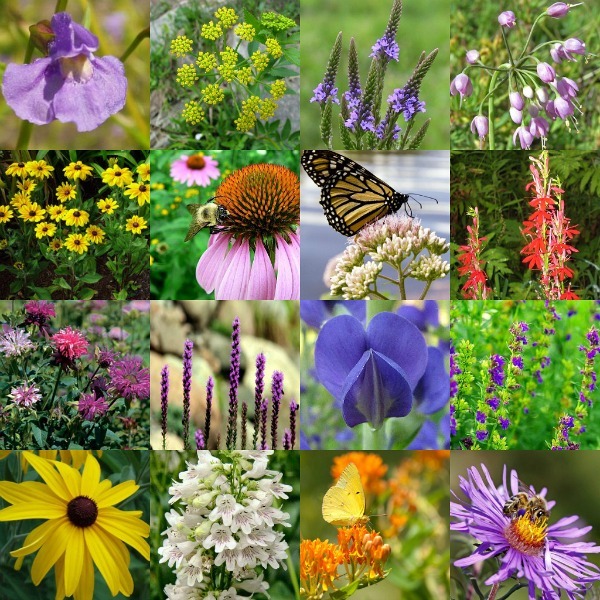 Flowers to attract bees, hummingbirds and butterflies. When the garden cottage was leveled last summer using cinder-blocks, there was a huge gap left exposed underneath. My sweetie put some chicken wire around the base to keep the animals out but that's something that needs to be finished off properly this season. 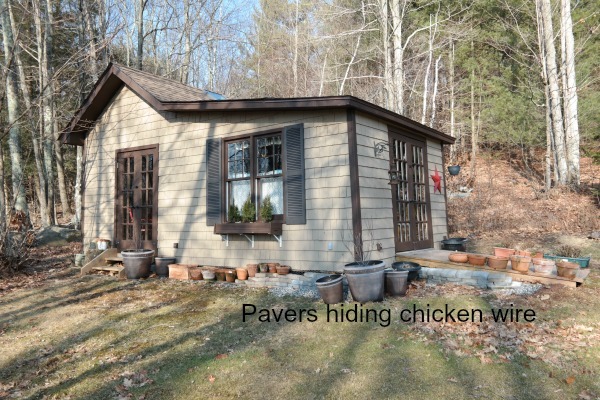 Currently we have some pavers that were found in a pile by the woods stacked up covering the chicken wire and holding it in place. But I'd really like to have a little garden around the cottage so we need to figure out a better solution. I really have no idea where to start with this...the slope of the land makes it very challenging. 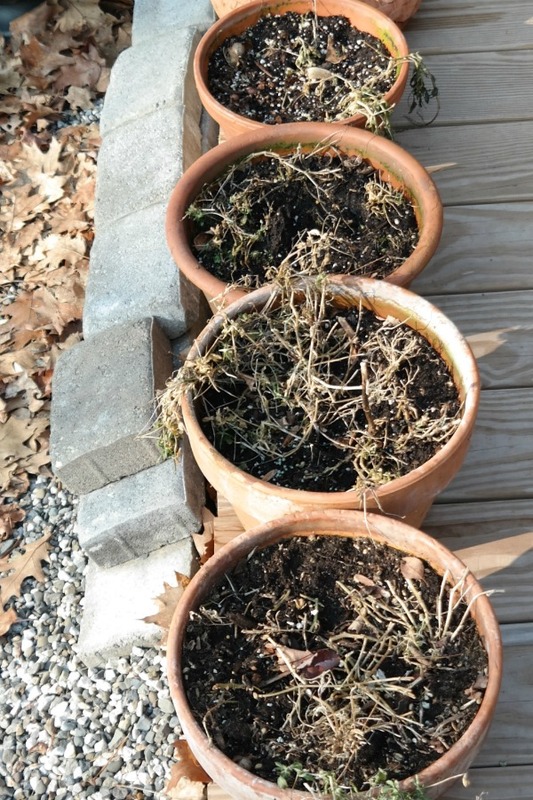 Meanwhile, I brought out all the pots that were overwintering in the garden cottage and gave them some water yesterday....there's not any sign of life but I'm still hoping. 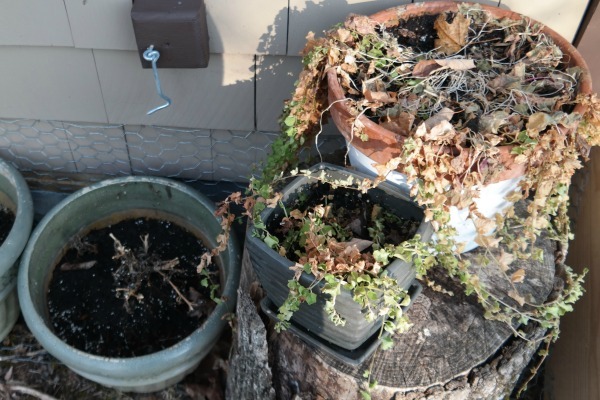 The only pots that are looking promising are the ones that hold the Creeping Jenny. 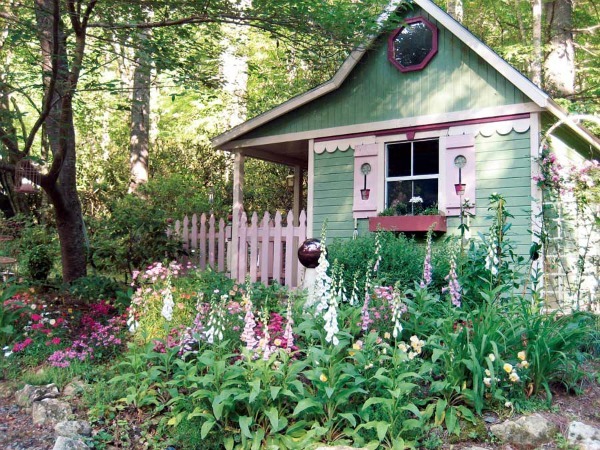 I have a long way to go in order to create that dream garden cottage that's in my mind. But that's ok, I'll keep on dreaming. And drooling over all the amazing she-sheds out there. And taking baby steps, one beautiful spring day at a time. Right now I'm thinking of beautiful fragrant white roses to climb up the corner. And maybe some fairy lights. And I'm looking for the perfect garden swing to put near the future wildflower garden. 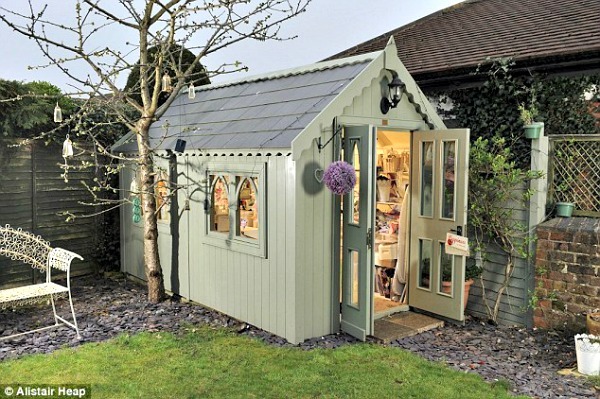 I'll take bits and pieces from all the amazing she-sheds I find out there and create my own little dream space. What a fantastic project I have ahead of me. Good point, Su - alpine plants would work, I suppose - I could do sort of a rock garden closest to the shed. I'll keep that in mind! What a fun project! 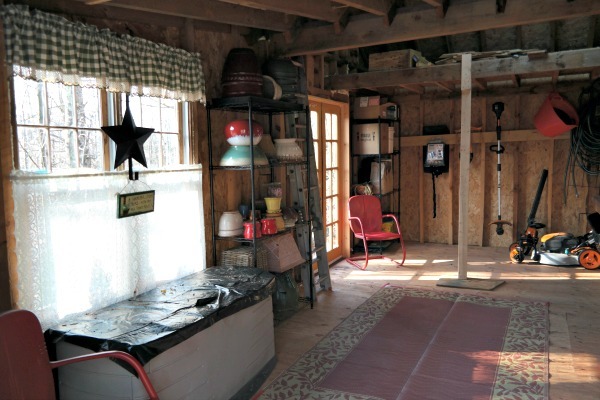 And you already have the bones for the whole thing...your dream shed is well within your reach. I will definitely enjoy watching what you do with this space. I'm so excited to get started, Courtney! My husband calls it a shed and I call it a Folly. Little does he know that the one he's building to store his man things will be kicked out so I can have my Garden Folly. He bought a fishing boat in December so he can't complain when I take over his newly constructed "Folly". ;) Your yard is beautiful as is your home! 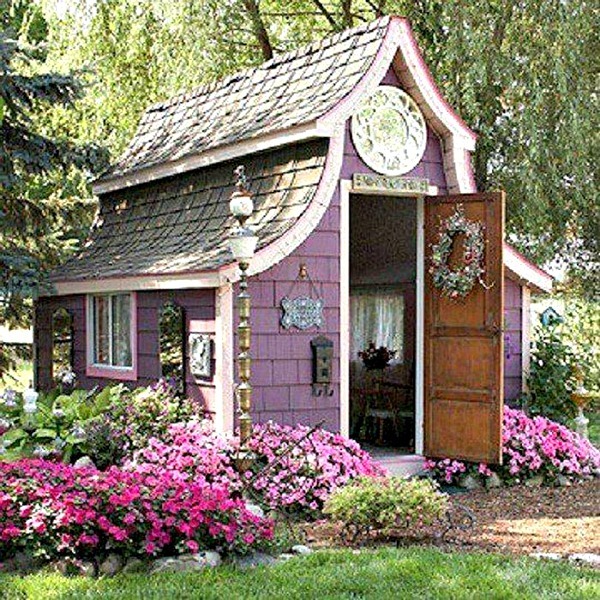 This is such a charming little building...I can just see it done, too! I know it will be a fun project! I wish you could come help me, Linda! I cut my Creeping Jenny all the way back. That gave it fresh and invigorated growth. Thanks for the tip, Brenda - I'm going to see if the 'straggly bits' green up, if not they will get hacked off!! Be still my heart the bridge...I love the bridge. I can't wait to see what you do. I love that little bridge also....it won't be happening at my house but it sure is cute!! I'm kind of partial to the white one with the red doors, but I'd take ANY of them! I am so excited to see what you come up with--I just know it will be just gorgeous! That one is probably the 'tidiest' of all the photos...and of course the red doors speak to me! It is quite spacious, Deb, although I think the photos make it appear even more so. 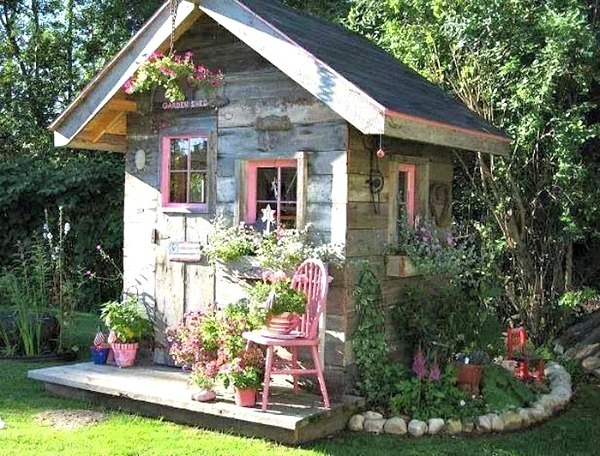 My daughter would love to take it over as her 'tiny house' - it's probably just as well there's no running water out there after all or I'd never get it back! Its going to look great!! Love all those shed pictures! Wow those are amazing! I know....I hope I can get mine to even come close to any of those photos!! How wonderful to have such a place and how fun to dream about! I was actually just pinning pictures of similar and flower dreaming myself this morning. I guess it's getting to be that time of year! It is, Jen! It's glorious here today - what's it like in your village? 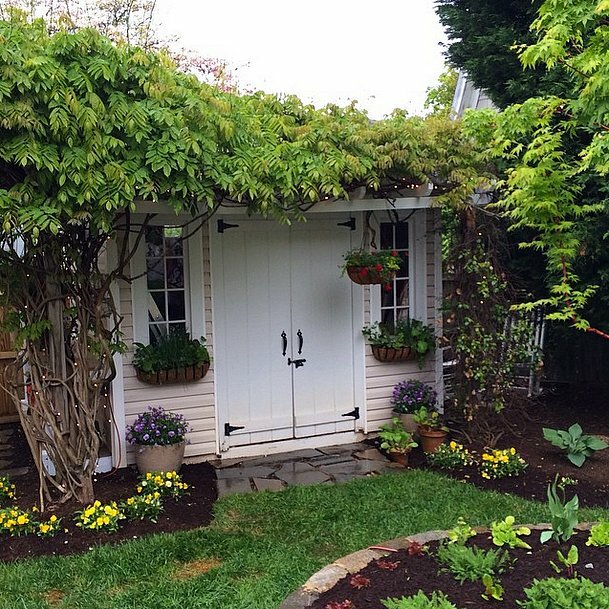 Your little shed is already a sweet thing. It shouldn't take much to make her dreamy look to come together. Some cut out wood embellishments, some paint, stuff like that. You'll be surprised what you can accomplish with a little. You are already on a roll, so have fun making your dream come true. I just ordered some flowers for the 'wild garden' and can't wait until they arrive and I can get started! I was out there with a cocktail yesterday after work just trying to figure it all out....I have the start of a plan! Ha ha...me, too!! Stay tuned, my friend....stay tuned. I'm going to be anxiously watching you transform your cute little garden cottage into your she-shed. You already have a head start, which is more than I'll get by living in the condo; but at least we have our cottage and gazebo. Maybe I can make a she-gazebo??? Hey, why not? I love a gazebo - I always wanted one! I think I'd put some fairy lights on it and plant roses to grow up it....heaven! It is pretty cute, isn't it? 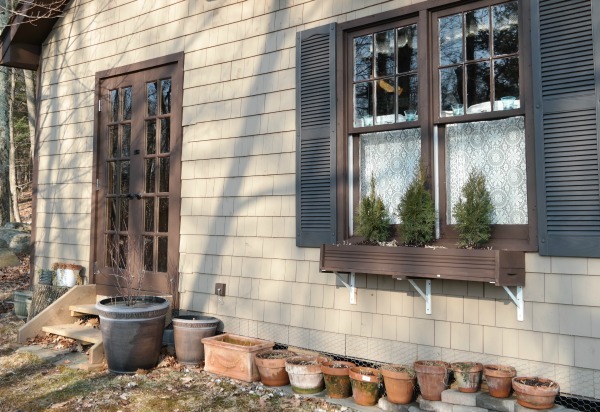 I saw potential even when it was a hot mess when I first bought the house! Good for you. I love wild cottage beds. Full of life and moving in the wind. And oh the flowers! And the butterflies! I had a lovely wild cottage flower bed in my prior home - I hated leaving my garden behind! OHHH I'd love to have a little she shed too. My dream is to have one using an old tiny vintage camper. If I can just get the hubby to agree!! Oh, Lisa, that would be so much fun! I actually was just talking about this with my daughters yesterday - I would love to buy an old vintage camper and glam it up!! 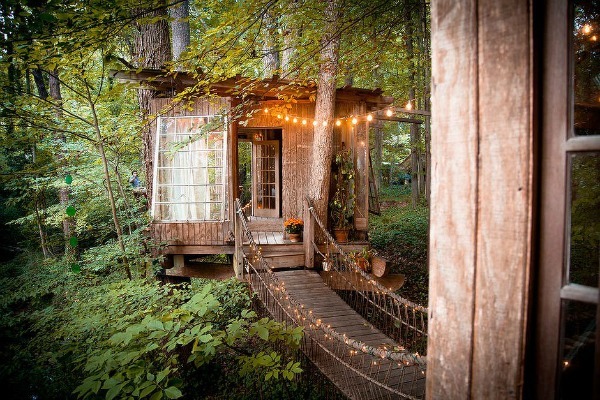 It could be like a guest house....or a tiny house for my daughter! I do so adore your garden cottage and your plans to surround it in lovely plants and perennials are perfect. I thing Hollyhocks are probably on your list of must haves! I am so glad you shared and linked. Hollyhocks and Foxgloves for sure, Bernideen - I do love an old fashioned cottage garden! I can't wait to see it done! You have a great start already and great plans for the flowers. Maybe a few daisies? I have tons of daisies at the front of the house so yes, I can transplant some there - good idea, thanks, AnnMarie! 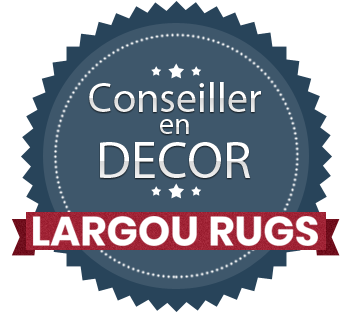 Thanks for linking with TOHOT. 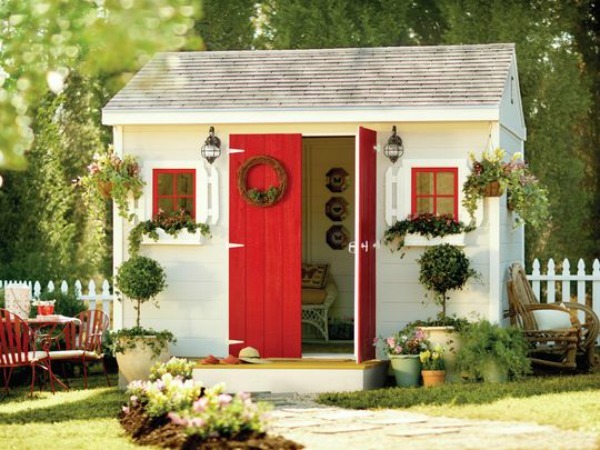 It is pretty large as far as garden sheds go....and the door in a fun color is a cute idea - perhaps when I figure out a color to paint the doors on the house I'll do them all at the same time! It looks fabulous already!! I want one too now. Thanks, Jennifer! It is pretty fabulous but I know it can be even more so! Oh how exciting, thanks so much - I'm honored!! 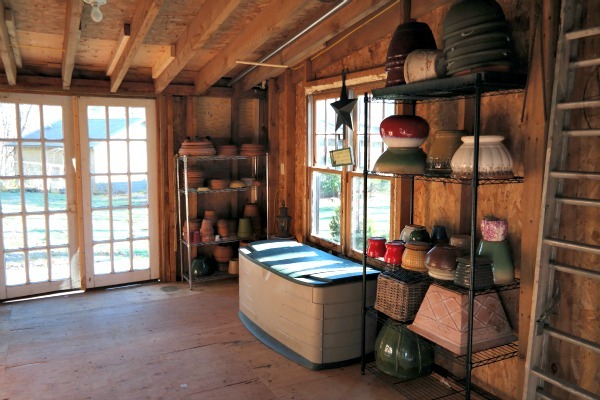 Debbie, you would LOVE mary's potting shed. 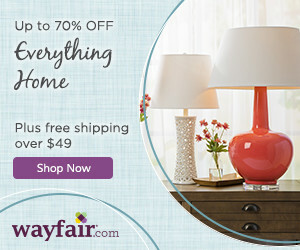 Her blog is: www.homeiswhertheboatis.net She is mega talented in tablescaping, flower arranging, gardening, you name it. tell her I sent you over. I have been following her for years. Thanks for showing me the link to your potting shed. I wish I could have one here but we live in a 55 plus community so it is against the rules:( I would have one in a second if I could! Have a beautiful day!!!! Oh What a Wonderful Birthday!